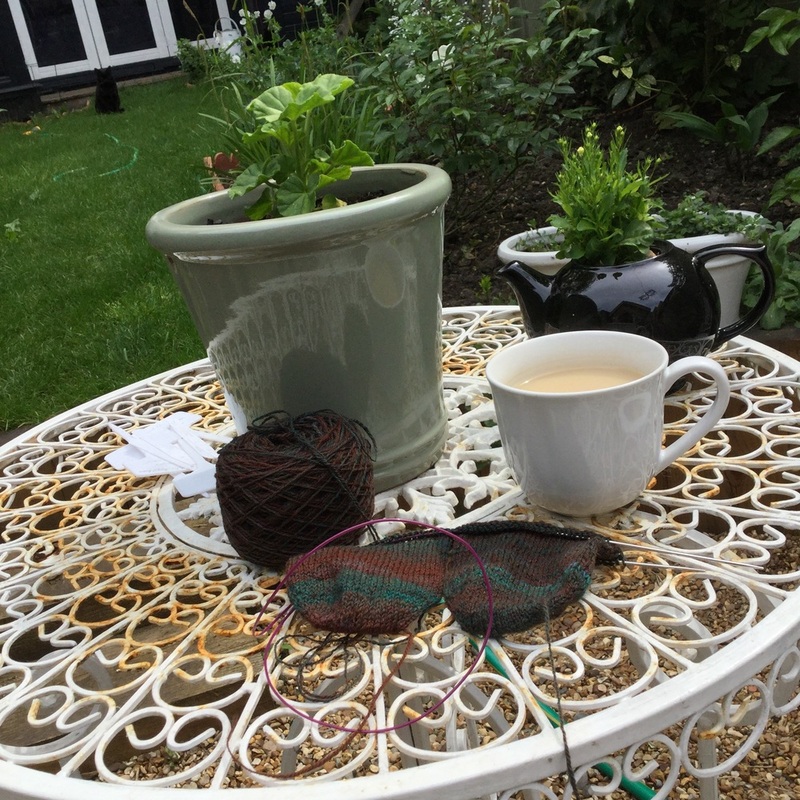 Tea and knitting in the garden this morning. This is handspun yarn, whose colour inspiration was a photo of verdigris and rust. I'm knitting up a pair of vanilla socks to really show it off for my sister's birthday. Two at a time toe up, and I'm going to be making the gusset from the centre of the sole as I did with the rusty socks a short while ago. I really like that heel. The news earlier this year warned of slug and snailmegeddon, and it's certainly the case here. I've already put down two treatments of nematodes, a natural slug killer, but still there're wreaking their damage. I had two hostas yesterday. Today I only have one! The plants are really starting to take off now that the weather is warmer. The rose I moved to make space for Grandad's memorial tree has settled in well, though the mild winter is manifesting in black spot and ridiculous quantities of aphids. In an ideal world, the garden would be completely organic, but this year I've resorted to an anti-fungal treatment. I'm hoping that if I can keep on top of it this year, and resist feeding the plants too much, they'll have a year of really strong growth which will set them up for next year. Long term thinking about gardens is so much easier and more rewarding when you know that you'll be here to see it! The jasmine on the weak trellis is already getting out of hand, which is no surprise considering our fence owning neighbours cut it all back with a hedge trimmer last September. Lots of the established plants have just started flowering, though the seedlings are way behind. They've been very weak this year, and I'm not sure if it's the weather to blame or a lack of skill on my part. The peonies are preparing to bloom, and the viburnum has its first flowers this year, though it's still only ten inches high! No lilac flowers this year, but there have been tonnes around HItchin. Seeing them established in other gardens has made me determined to train ours as a small tree, instead of the spreading shrub that it can be. And look at the new growth on this thing! This shrub and I are old friends. It was in a large ceramic pot and left in my care when someone's mother was moving house and never reclaimed. For several years it lived outside my front door, surviving droughts, snow and freezing winters, always making the effort to out on new growth even though it was entirely pot-bound. I used to promise it that one day I'd plant it in the ground, and when we moved in here, I was able to keep that promise. Getting it out of the pot was the biggest challenge! In the end I had to resort to picking it up and dropping it on a paving slab, smashing the pot to smitherines. It spent last year settling in to the damp, deep soil it gets on the right hand side of the garden and this spring is taking off with a sense of real joy. Plant joy. I'm looking forward to seeing how everything grows this summer.